Look up the word "popular" and you'll find Stone Torres's picture. His life seems perfect—star of the football team, small-town hero, lots of friends. But his family is struggling to make ends meet, so if pitching in at his mom's dance studio helps, he'll do it. New York Times bestselling author Rachel Harris returns to YA with a passionate, emotional romance perfect for fans of Sarah Dessen or Huntley Fitzpatrick. 5.0 out of 5 starsSuch an effortless read! Stone is fantastically written, it’s nice to know what goes on inside the mind of your QB to be honest. Rachel Harris has done it again. She pulls you in and wraps you up with characters who become family. Eyes On Me is a must read! Summary: Lily Bailey is a proud nerd. She loves books and spends more time studying than she does at high school football games. Lily’s life begins to change when after a stress induced trip to the hospital, her dad forces her to take ballroom dancing lessons. At her first lesson Lily encounters Stone Torres, the high school’s star quarterback and son of the dance studio’s owner. Lily’s dad knows she doesn’t want to spend her free time learning to salsa so he offers Stone a large payment if he will become Lily’s permanent dance partner and encourage her to keep taking classes. Stone knows that his family’s business is in jeopardy and reluctantly accepts Mr. Bailey’s money in hopes that he may be able to help keep the studio open. However, as Stone and Lily spend more time together the two form a connection that neither want to lose. What’s Good: I love a book with a smart main character and Lily was a fabulously brainy girl. Also, s a person that reads a lot of YA, I appreciate when an author has an original angle. Harris’s dance studio romance had a very cute and originally feeling premise. What’s Not So Good: It took me a really long time to warm up to Stone and Lily. They just didn’t really connect for me until about a third of the way through the book. I was may more interested in the possible romance between Stone’s sister and his best friend. Bottom Line: This is a cute book about opposite attract that fans of YA romance will enjoy. 4.0 out of 5 starssuper cute, young adult book with dancing! so good! I really liked this super cute, young adult book. It was cheesy but soooo good. While it was a pretty common trope we see with a smart girl and a jock, this was different in many ways. There was the added factor of dance lessons, which I thought was so fun, especially between teenagers. It really showed the benefits of dance throughout the book. All the characters added dimension to the story. The main characters, Lily and Stone, were perfect together. They thought they were so different from each other, when in reality they had a lot in common. Stone is more of a live in the moment guy vs. Lily’s planned her entire future out. While Stone was popular, Lily was a nerd, yet they both were hiding in plain sight. But, they both showed a lot of change throughout the book. Stone was seriously the nicest jock. The only problem I had was obviously him taking money from Lily’s dad to dance with her, but you do understand why he did it. And Lily, my heart seriously broke for her. She had been dealt a rough hand lately and I just wanted to give her a big hug. She also had anxiety and I thought the way Harris explained Lily’s feelings of anxiety was done exceptionally well. My only complaint would be that it was slow paced. I really had to push to get into the book, but it was so worth it in the end. I would definitely recommend this sweet young adult story. I really hope we can get a book for Angela and Chase now! * ARC provided by NetGalley and the publisher in exchange for an honest review. Thank you! 5.0 out of 5 starsThis story had me smiling and loving the story! As you can tell by my rating of 5 stars, I adored this story! It was one I picked up and was immediately sucked into what was happening. The characters were extremely relatable, but also realistic. While we had the klutziness of our heroine like we see a lot of times, she was able to get over it when she wasn't spending so much time dwelling on it, and just worrying about what she was doing in the moment. And then there was our love interest, Stone, it was impossible not to adore him. Because even though he was sweet, and a perfect book boyfriend, he still was a teenage boy, and the way his character did things and reacted to situations was very realistic, in my opinion. The one issue that I knew would be hanging over Stone's head and probably cause our big final bit of drama, while obvious, the money her father had paid him, played out in a such way that made what normally seems like an overreaction in this type of situation to me, made perfect sense. I still adored the way he made his grand gesture, loved Stone's sister Angela's movie love for this. So much of this story had me smiling and happy, and I can't wait to share this book with my students, as well as other readers! 4.0 out of 5 starsI applaud Rachel Harris’ EYES ON ME. I applaud Rachel Harris’ EYES ON ME. Concerned about her stress level, Lily Bailey’s father enrolls her in dance classes in hopes of relaxing her. Unknown to her, he offers star Brighton High football player, Stone Torres, money for being her dance partner. This contemporary sports romance is suitable for young adults. 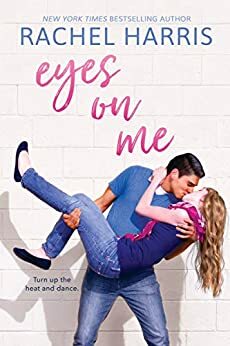 EYES ON ME was an entertaining and believable read. The characters were well developed. I like Lily. She puts a lot of stress on herself to become valedictorian and to get accepted to Harvard. After winding up in the hospital, her father enrolls her in dance classes as an activity to get her mind off her classes. Stone is a good guy. Out of concern for the financial well-being of his mother’s dance studio, he accepts money from Lily’s dad to be Lily’s dance partner. As he gets to know Lily, he feels conflicted about taking the money. Cameron Montgomery is the perfect antagonist. She is Lily’s competition for valedictorian and Stone’s ex-girlfriend. I enjoyed the plot. There were good life lessons and moral issues. I have taken ballroom dance classes, so I respected that aspect of the story. Being Hungarian, I appreciated that Stone’s mom/dance instructor was born there. I like that the characters faced significant obstacles and grew as a result. This is the first book that I have read by Rachel Harris. I enjoyed her writing style. I would read books by her in the future. I voluntarily reviewed an advance reader copy of this book.